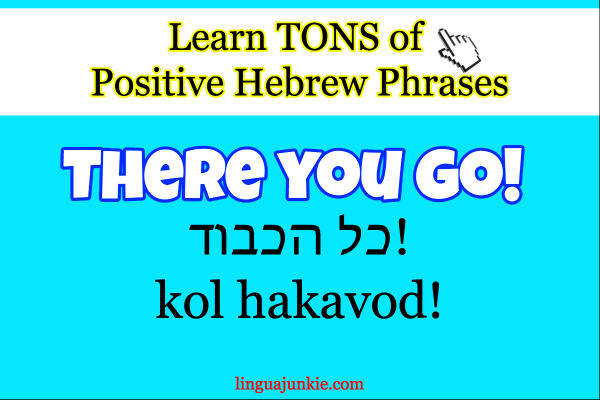 Want to learn some positive Hebrew words and phrases? The kind you need you know as a learner? For conversation? Yep, you’ll learn them now. So, set aside 3 minutes, turn down the music and read on. If you’re interested in MORE Hebrew lessons, click below. Now, as you read these, be sure to listen to this free audio lesson too. Why? 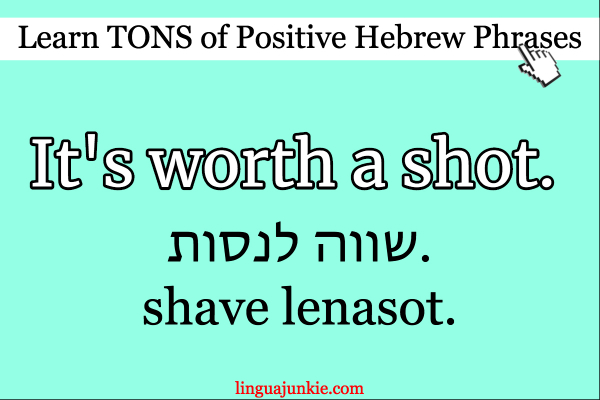 You get to hear REAL Hebrew pronunciation. And if you repeat out loud, you’re practicing speaking. So, press the play button below. 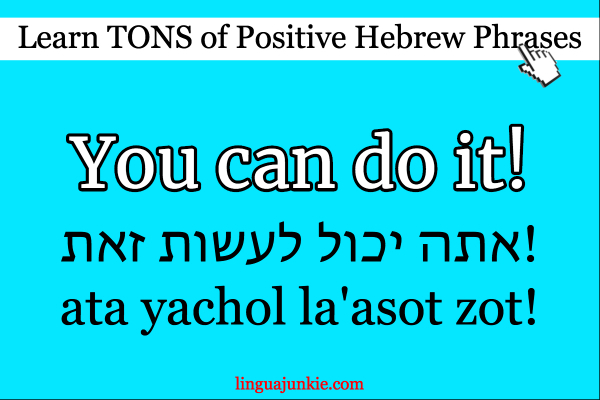 Yes, you can indeed learn Hebrew. All you really need to do is turn a lesson on and start listening. It’s that easy! What’s your goal or dream? Learning Hebrew? Skydiving? Earning a ton of money? Well… you should start now. Why? Everyone that’s ever started and made progress always wish the same thing — they wish they started earlier. By now, they’d make a ton more progress. You’re not. 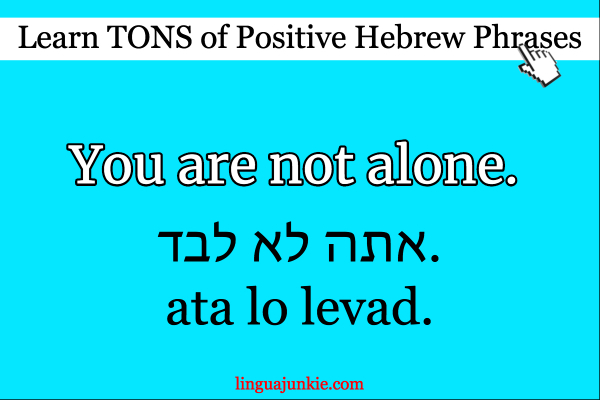 Aside from you, there are millions of others learning Hebrew worldwide for all kinds of reasons. There are also tons of teachers teaching it. So… go find them. You won’t be alone. 4. I’m so proud of you! 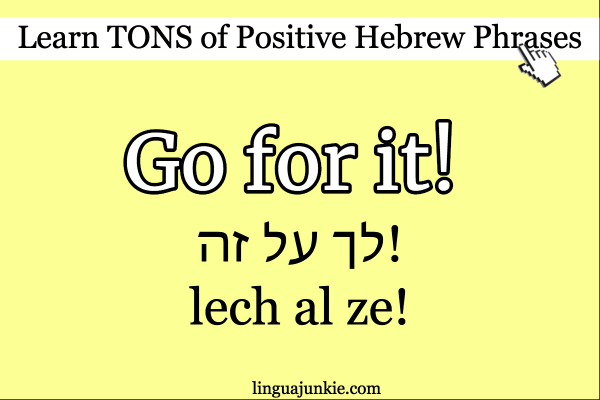 These are some good, positive Hebrew words to know. And hey, I’m proud of you for reading this. Say it with me: ani kol-kach ge’e becha! 5. Keep up the good work. Everyone wants to hear “good work” every now and then. Sadly, no-one tells me this with my website. But, I’ll tell you. 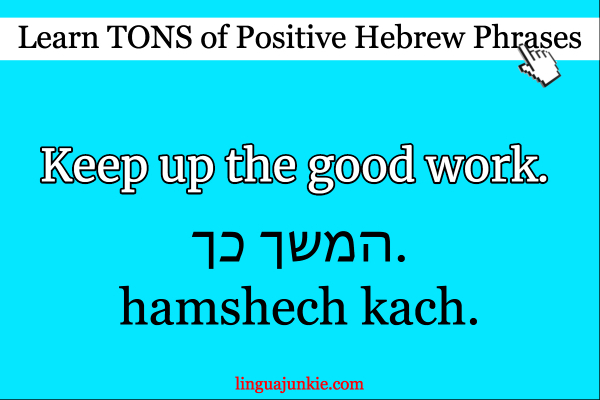 And you can tell another Hebrew learner and give them some positivity. Why can’t you give up? Because learning and mastering Hebrew is all a matter of time. The more time you spend on it, the better you’ll get. It’s all time. 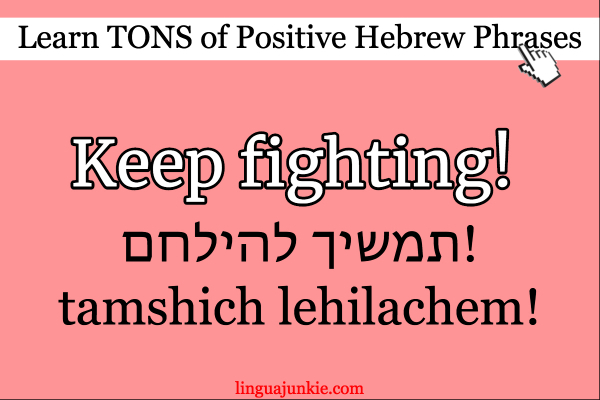 So, you have to keep fighting, keep speaking and keep practicing Hebrew. 8. It’s worth a shot. If you’re unsure about something, remember it’s worth a try. 9. What do you have to lose? 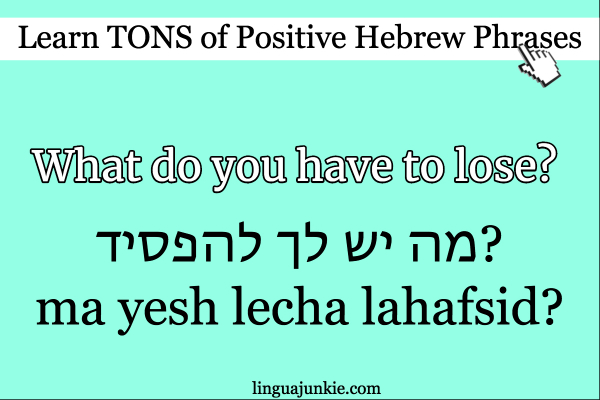 You really don’t have much to lose by learning Hebrew. Time? No. Time passes on anyway, regardless of what you do. So, go for it! Play a lesson. Read a word out loud. Spend 5 minutes now. Then, spend another 5 minutes tomorrow. Yes, you can’t get fluent in 3 or 10 days. But just like working out at the gym, in 2 months, you’ll start seeing progress. Why don’t most people see this progress? 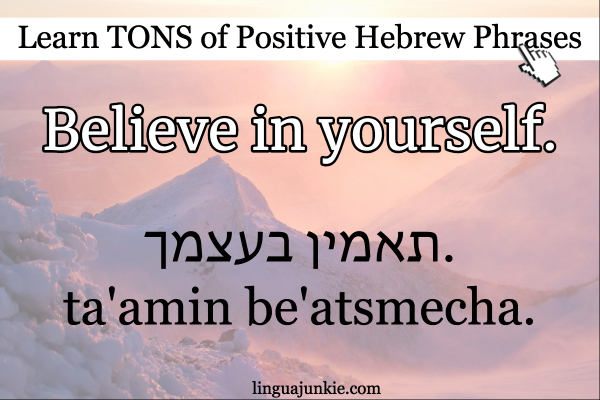 Another one of my favorite “positive Hebrew words.” If you don’t believe in yourself, well remember, someone else believes in you. In fact, it’s a fun rule of like. People believe in you MORE when they see that you believe in yourself. 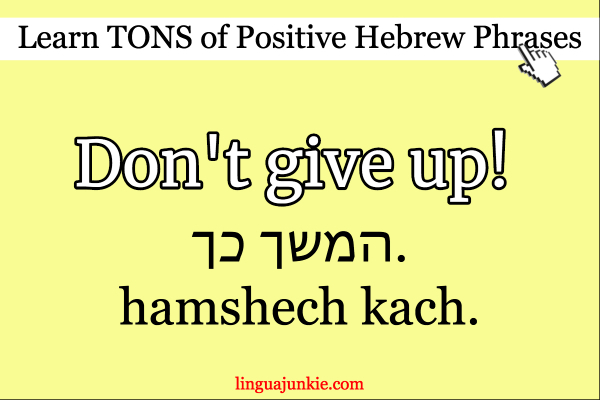 Some days, you won’t want to learn Hebrew. You’ll want to watch TV. My advice? “Tihye chazak” — stay strong. Try to put in 5 minutes of learning anyway. It’s the bad days that count the most, not the good days. 14. The sky’s the limit. 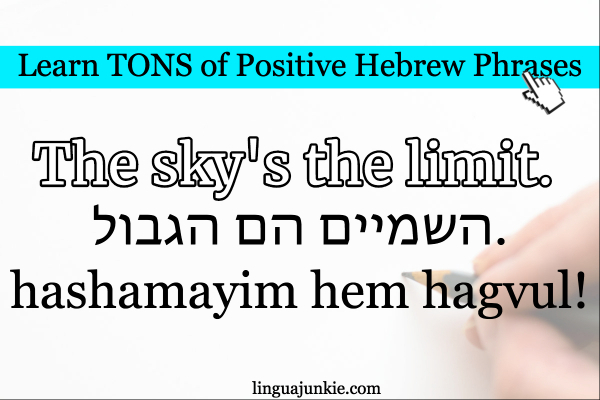 What’s a good small step for learning Hebrew? Well, you’re doing it now. 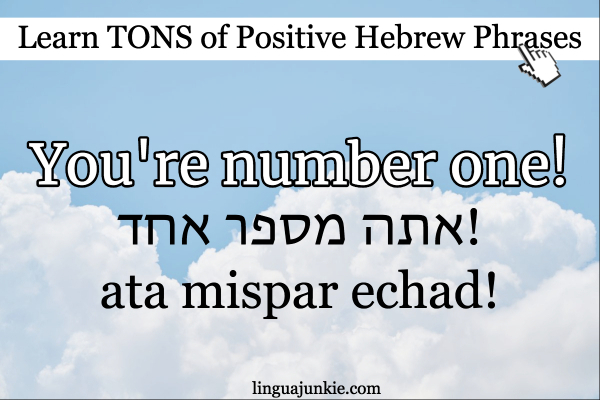 You’re reading the article and learning positive Hebrew words. There you go! 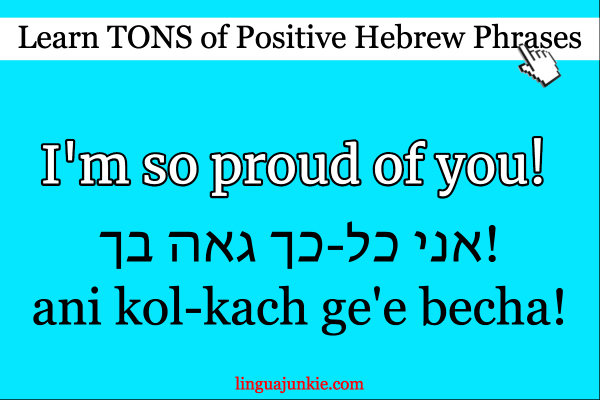 You finished a whole article of positive Hebrew words. Was that hard? Of course not! Just don’t “overdo it” or “overwhelm yourself” and you’ll be okay. 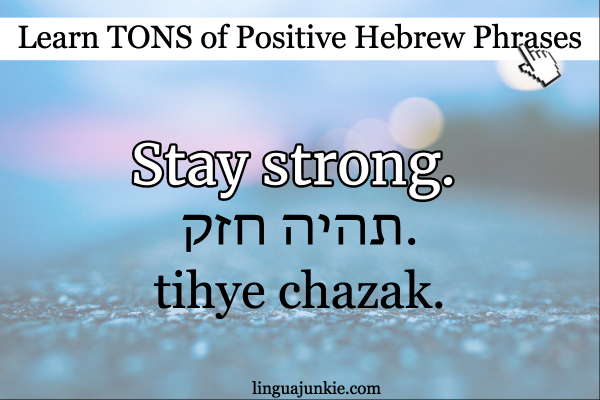 Now you know a whole bunch of inspirational, positive Hebrew words. You can easily use these in conversations. Especially when you need to encourage or cheer someone up. P.S. 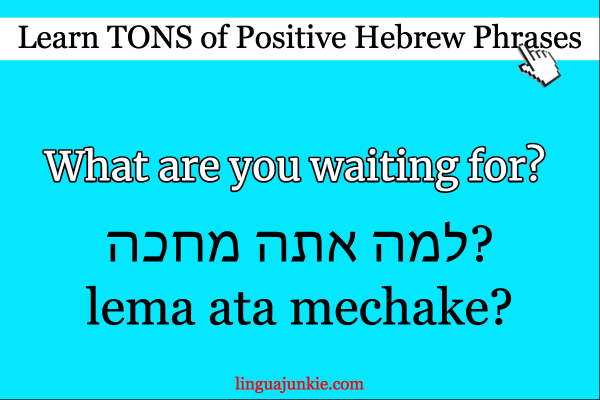 Done with reading articles and want to learn Hebrew for real? Okay! I recommend HebrewPod101.com — an online learning program with audio/video lessons made by real teachers. You can learn to speak, read and write, AND take your lessons on any device.